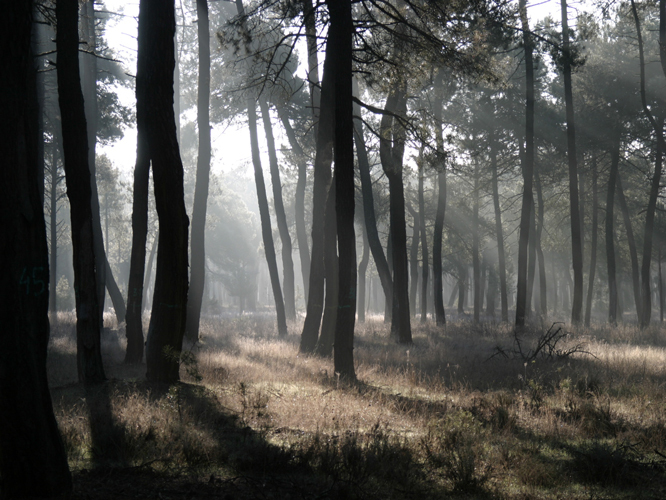 Maritime pine forest in the Castilian Plateau, central Spain. Maritime pine forests support a great diversity of associated fauna and flora, in particular in the Mediterranean region where they grow within an intensively humanized agricultural landscape. Photo credit: Ana I de-Lucas. In 2009, after five years parching under the arid blue skies of Calcena in northeastern Spain, dozens of neat rows of maritime pine seedlings had grown unevenly. Some of the seedlings had died years ago, some were stunted but hanging on, while others grew tall and green. The trees were not in their native soil. They had been grown from seeds collected at 19 sites around Spain, Portugal, France, and Morocco, and their growth was being monitored at a single site with an extreme climate to help predict the future of their species. The experiment was designed to improve models that forecast where forests will grow as the southern European climate grows hotter and drier, and promises to help forestry managers choose tree stocks and decide where to focus reforestation efforts. In the March issue of GENETICS, Jaramillo-Correa et al. reported the results, identifying a handful of SNPs that can be used as predictors of maritime pine survival under different climatic conditions. The maritime pine (Pinus pinaster Aiton) grows widely in southwestern Europe and parts of northern Africa. But the tree’s important economic value and ecological roles in the region may be at risk as the changing climate threatens the more vulnerable forests and the productivity of commercial plantations. Range-shift models are key tools for managing forests as the climate changes. These forecasts are based mainly on ecological and physiological data, however, and don’t take into account two major influences on a forest’s fate: genetics and evolution. Genetic differences between tree populations mean that forests vary in the degree to which they cope with changing conditions. Natural selection will also influence the prevalence of such genetic variants as the climate shifts. Genetic effects can drastically change range-shift predictions, says González-Martínez. The maritime pine project sought to identify and quantify such effects in a way that could be readily incorporated into existing models. To track down genetic variants that affect maritime pine fitness in different climate conditions, the team decided on a candidate gene approach, which is considerably faster and cheaper than surveying the large and complex maritime pine genome. Pine researchers from around the world pooled their expertise to yield a list of more than 300 SNPs in 200 candidate genes. “It was really a community effort, drawing on 15 years of research across many labs,” said González-Martínez. From this candidate list, the team tested whether any of the SNPs were associated with climate variables across 36 natural populations, after correcting for geographic patterns in SNP frequency due to the different demographic histories at each site. Eighteen of the candidate SNPs showed significant associations with climate factors. These variants affected many different biological processes, including growth and response to heat stress. The researchers then looked for evidence that these SNPs are important for fitness. They planted over 6,000 seedlings from 520 families and 19 locations together in the “common garden” in Calcena, where the climate falls at the extreme dry end of the species’ range. After five years, tree survival was significantly correlated with the frequency of SNP alleles predicted to be beneficial in the Calcena climate. In other words, the seedlings that were still thriving after five years in their new home tended to be the ones genetically well equipped to survive the harsh climate. These results demonstrate the feasibility of this relatively fast approach of finding and confirming genetic variants associated with climate. Now that they have shown the method works, González-Martínez and his colleagues are expanding the project to cover more genes and more traits. “The single biggest climate change threat to pine forests is the increased frequency of wildfires, so we’re searching for variants that affect fire tolerance,” he says. They are also planting common gardens at many different locations—growing thousands more little seedlings whose fate will help geneticists predict the maritime pine’s future.